Tucked away in a secluded location off the A392, this compact one bedroom flat is perfect for a secret hideaway whilst still being close to the attractions of Newquay and its golden beaches. Take the flight of steps up to the flat where you will be greeted by a homely, open plan living room. Comprising of a comfortable sitting area, well equipped kitchen and breakfast bar, this accommodation may lack in size, but it excels in functionality. The one tastefully furnished bedroom hosts a plush double bed that assists in a great night sleep. Just next to the bedroom you will find the bathroom with overhead shower, WC and basin. Walk out onto the patio and you will be rewarded with panoramic countryside views that surrounds you. From here, walk in any direction and you are sure to be pleased with rolling hills, woodland areas and even lakeside walks in some regions. Appealing to surfers and beach lovers alike, this property is positioned within 6 miles of stunning beaches including Watergate Bay, Whipsiderry, Porth, Lusty Glaze, Great Western, Towan and the world famous Fistral Beach, meaning that you can visit a different beach for almost every day of the week. Your nearest village, Quintrell Downs, is a quaint settlement that presents a choice of 3 pubs as well as well-stocked shop for your essentials. Newquay itself offers a more diverse range of cuisines from seafood to tapas, if you fancy more variety. Set in brilliant location with Newquay close by, The Little Hideaway is a gem of a rural escape. One double bedroom. Bathroom with shower, WC and basin. Open plan living room, kitchen, breakfast bar and sitting area. Pub and shop 1.5 miles. Holywell 6 miles; Perranporth 8.5 miles; Truro 14 miles; Padstow 14 miles. Newquay is the home of the UK’s surf scene, boasting three major beaches, the National Surf Centre and an endless supply of rolling surf, making it a watersports paradise. The town, with its zoo, sea life centre and varied selection of restaurants and pubs, also promises a holiday to remember. For avid walkers, the South West Coast Path passes in both directions along a stunning coastline of high cliffs, hidden coves and yet more beaches. The quaint harbour and fishing village of Padstow is just 14 miles away, while Truro, with its museums, cathedral, restaurants and cobbled streets, as well as the Eden Project, can be reached within 45 minutes. Picturesque St Ives and the Tate St Ives gallery is around an hour's drive or a train ride away. 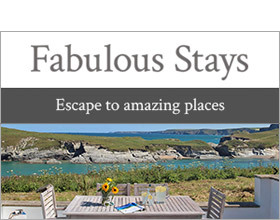 In fact, because nothing in Cornwall is far from Newquay, it’s the perfect touring base.